Reading, critical thinking, and civil discussion of important ideas matter more today than ever before. The Great Books Foundation seeks to make quality literature and discussion opportunities available to people of all ages. Help us to sustain and expand our community programs, professional development, and publishing initiatives. Talking Service, our national reading and discussion program for returning veterans, is now active in 17 states. The program helps men and women of the armed forces discuss shared experiences and build community. Your support will help us work toward establishing Talking Service groups in all 50 states. 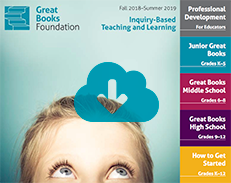 Great Books Great Kids provides professional development for teachers and Junior Great Books materials for students in underserved communities. This program has helped students significantly improve their reading comprehension, critical thinking, and writing skills. Your support will help us reach more schools and students. Your support will help us reach new and underserved groups and advance innovative, inclusive programs. Together we can build on the Foundation’s more than 70 years of innovation and outreach. Making a gift online is convenient and secure. The Great Books Foundation is a 501(c)(3) organization, so your gift is tax deductible to the extent allowed. If you are interested in learning more about planned giving or making a leadership gift, please contact Valentina Texera-Parissi, CEO, at 312-646-7112 or use the form on the right. All gifts are important. All gifts make an impact. Your gift will be gratefully received and wisely used.